2 bedrooms with a queen or double serve as retreats for couples or families. Each bedroom features a flat screen TV, lounge and reverse cycle heating & cooling to enjoy your own space. All bedding & linen is provided. The modern bathroom features a shower & toilet with provisions supplied. Crystalbrook Cottage is fully dog friendly with a huge enclosed rear yard and undercover patio, your furry friend will feel right at home. Cap everything off with a full laundry and the entrance to Mt Buffalo National Park being at your doorstep making this the ideal retreat for hikers, riders and snow play lovers - and you've found your perfect haven. Within 12 minutes DRIVE from : the centre of Bright! The gorgeous town of Porepunkah is the gateway to Bright, The Buckland Valley and the ideal place to rest your head when venturing to Mount Buffalo. 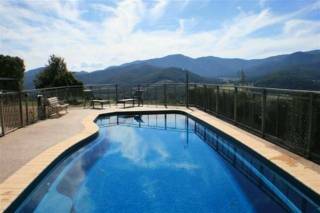 With the Ovens River running through and views of Mt Buffalo and Mt Feathertop as the backdrop, you can enjoy an Alpine getaway without the hustle bustle. Hit the Rail Trail into Bright or back towards Myrtleford visiting wineries and farm gates along the way. Relax on a lilo down the river or find a secluded secret swimming hole! Hike to the horn at Mount Buffalo for breathtaking views or enjoy an affordable family snow holiday in Winter. 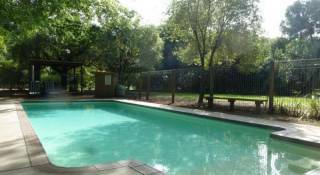 Hit the river at the local playground with toddler pool, jetty & BBQ facilities. Enjoy the Punkah Pub beer garden for a counter meal or a delicious breakfast or lunch at The Rail Trail Cafe. Get spoilt at Boynton's Winery with an amazing playground for the kids - during busy periods they run a bus from Porepunkah and back again! Regular live music and events to keep you coming back. Stroll the area, let the kids ride their bikes safely or just enjoy the peace & quiet and all just a few minutes drive from Bright and just that bit closer to the rest of the region! Crystalbrook Cottage offers the ideal winter haven situated in an ideal, central location for all snow lovers! 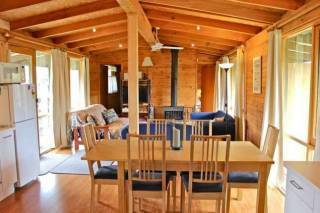 Your furry friend is welcome to join you at Crystalbrook Cottage. The rear yard is fully secure with a kennel. Dogs must NEVER be left inside the accommodation without an owner present - if a dog is left inside unattended instant eviction will apply with no refund. If your dog is a shedder, please use sensibility and keep them off areas where hair will be an issue or please clean up their hair before you leave. Please try at all times to limit your dogs access to tiled or floored areas whenever possible.